Powerful poker HUD software. Optimise your online poker game. Exploit your opponents' weaknesses. Try playing online poker with a HUD (head-up display) and you'll wonder why you ever played without one. Information about each player is displayed live, on the poker tables. The information is updated after each hand so that you always have the best information available when making decisions. Poker Copilot continually monitors your hand history for updates. Updates are immediately processed. On-screen statistics automatically include these updates without any action from you. When you finish playing a hand within a few seconds you'll see the data on-screen update to include that hand. 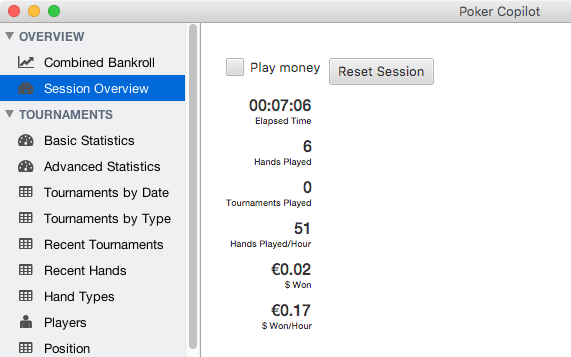 Poker Copilot is a native application for Mac and for Windows. It offers poker tracking that integrates seamlessly with your desktop and your online poker programs. Poker Copilot uses accumulated data to find the mathematical errors in your game so that you can eliminate the persistent errors in your playing style. Better still, it helps your find the mathematical errors in your opponents’ games so that you can exploit the persistent errors in your opponents’ playing styles. Poker Copilot works with PokerStars, Full Tilt Poker, Winamax, 888poker, Merge Network, Ongame Network, iPoker, Revolution, and Winning Poker Network. Poker Copilot includes a set of leak detectors that instantly locate the flaws in your playing style that are costing you money. Get rid of those recurring mistakes that are hurting your bankroll. 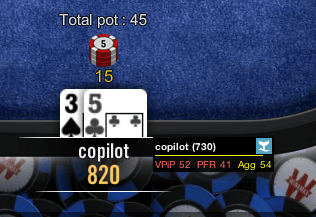 Poker Copilot's HUD overlays player info directly on the poker table. You can instantly see how many hands you've played against an opponent, and how they've tended to play against you. A player's style is broken down into more than 60 poker statistics and these statistics are available to view directly on the poker table. Choose your favourite statistics to keep in view at all times, while the rest are a single mouse click away. Start with fundamental poker statistics such as "VPIP" (voluntarily put money in pot), "PFR" (pre-flop raise), and "Agg" (post-flop aggression). As you master these poker stats, augment them with a full range of detailed statistics, broken down by position and street. Making a tough decision at a critical point in a poker tournament is easier when you have your full history against a player broken down into clear information. The bankroll charts let you track your winnings over time. You can view winnings broken down to showdown and non-showdown winnings, for ring games and for tournaments. Using Poker Copilot's filters, you can determine which format of poker is best for your bankroll. Is 6-max your specialty, or is heads-up the game that sends your bankroll upwards? Are you doing well from the button, but losing when in the cut-off? Poker Copilot answers these questions. Poker Copilot has a number of leak detectors. In poker, a leak is any place where you are slowly and consistently giving away chips to other players due to mistakes in your game. 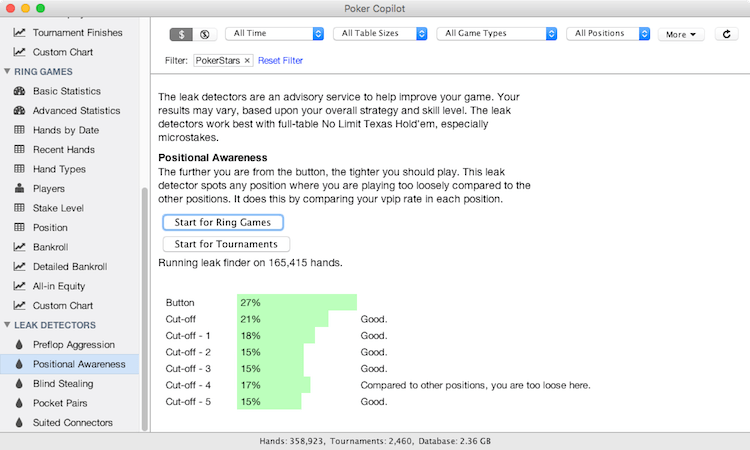 Poker Copilot's leak detectors analyze your playing history to make sure that you are correctly applying core poker strategies, such as positional awareness, preflop aggression, and blind stealing. Each leak detector points out exactly where you are leaking chips, and advises actions to take to improve your game in that area. The built-in hand replayer lets you review critical hands. You can step forward and backward through a hand to evaluate your actions. At each step of a hand the replayer displays your probability of winning. You can see how your odds change as other players fold and as the community cards are revealed. 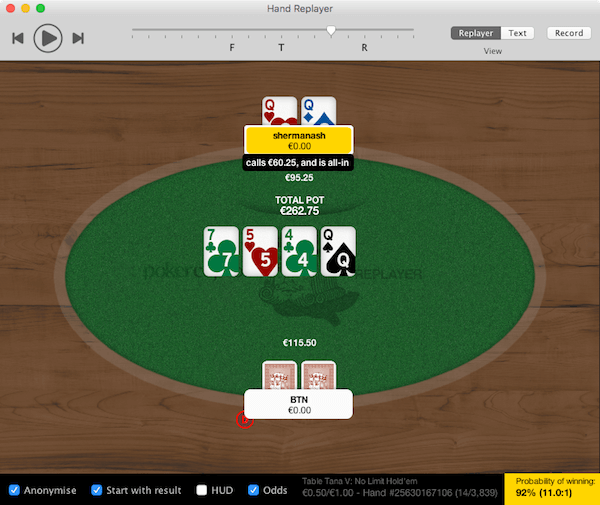 The hand replayer is a great way to perform a post-session review. Want to share your hands? The hand replayer lets you record hands into a video you can share with your friends or poker coach. The hands are formatted by the replayer ready for copying and pasting into the most popular poker forums. Keep track of how long you play, and how you've been performing in your current playing session. 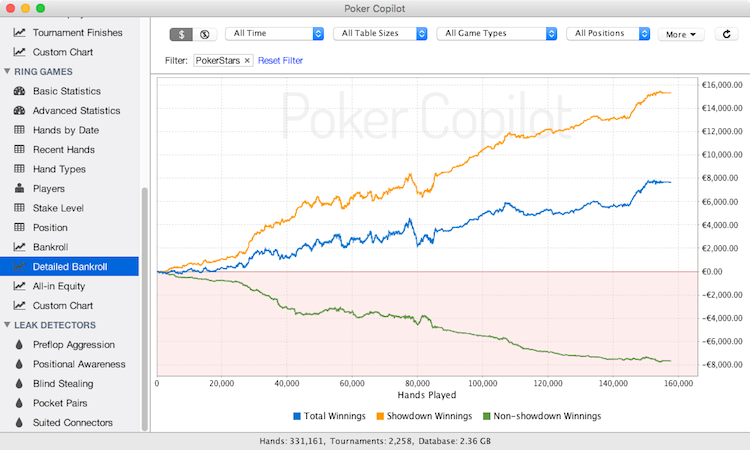 "I started using Poker Copilot a few weeks ago after a recommendation, and it paid for itself within hours. It's completely turned my game around. You run a great site and have a great piece of software, and I know a lot of people who use your product and are happy with it." "Poker Copilot has helped me unprecedentedly in improving my poker game. The best app for Mac users." "Finally, a Mac poker analyzer that works! I paid for it 4 days into the trial period. It had already paid for itself, it helped my game that much!" "Poker Copilot was like adding a huge piece to the jigsaw puzzle of my game. The results have been amazing." "I just wanted to say thank you for creating this tool! I bought a license a few months ago and have to say, it blows every other Mac tracker out of the water." "I got Poker Copilot and it improved my game a TON. The HUD was great and the stat tracking was amazing. I have used Hold'em Manager and Holdem Indicator, but I prefer Poker Copilot over both."